Ingrown hairs can be an unsightly, irritating nuisance and if all else fails tweezers can be used to gently tease them out. The best, most effective type of tweezers for doing this are those with pointed tips. which also just happen to be great for removing splinters, glass fragments etc. 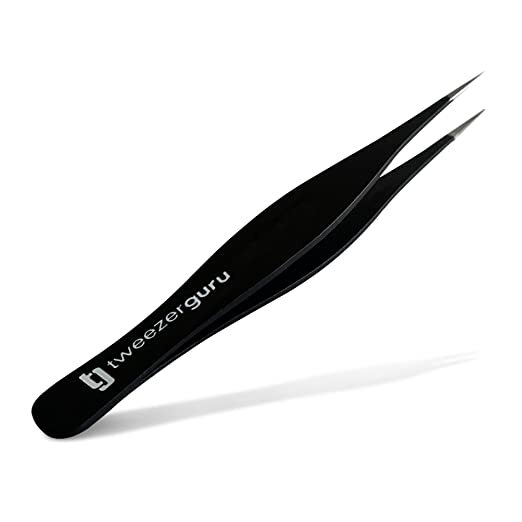 These tweezers from the ever-popular Tweezerman are manufactured in India from surgical quality stainless steel and come complete with a plastic cap to protect the tips. As you would expect from Tweezerman, they are a good quality product with perfect alignment, hand-filed precision tips and good tension. ​The look and feel of the tweezers is that of a sturdy, well weighted easy to hold product with tapering ends culminating in sharp pointed tips. Although they are not quite as needle-like as some of their rivals, in my opinion this does actually make them a little more easy to use, especially for fine hairs. 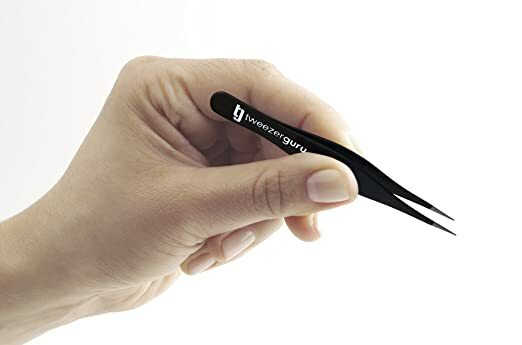 In use, the Tweezerman Ingrown Hair Splintertweeze is effective, its pointed tips are exactly aligned to grasp the hair and tease it out into the open. They come with the Tweezerman offer of free sharpening service for the life of the tweezers or a 50% off coupon for a comparable replacement, when sharpening is no longer possible. Retailing at just under $14 - an affordable, low-mid range pair of good quality tweezers. These high quality, low cost tweezers are really good value for money, currently retailing at between $7 and $10. The well aligned, precise tips are extremely pointed and sharp and come with a protective plastic cap for storage and in a plastic sleeve - handy but probably not sufficiently robust to be long-lasting. They have a sturdy thumb grip, to make them easier to hold and control, and are well calibrated with perfect tension. ​In use, they can grasp the smallest, finest of hairs with their sharp tips, given some practice. It can be difficult, at first, to use such fine tips if you are used to regular slant-tipped tweezers. 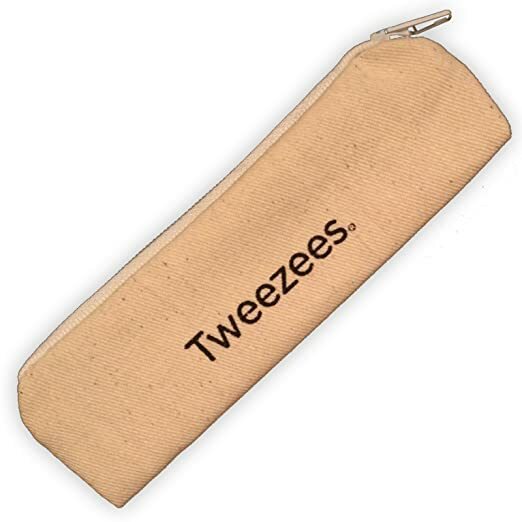 The Tweez'em Stainless Steel Precision Tweezers by Majestic Bombay are manufactured in Pakistan and have a bright and cheerful yellow enamel coating. They have a good, wide-grip design, measuring 1.4 cm at the widest point and needle-sharp well-aligned tips for grasping ingrowns, splinters and the like. They come complete with a plastic cap for tip protection and a handy plastic storage tube. ​In use, they are effective for the purpose of removing ingrown hairs etc., although fiddly and not so efficient at tweezing stray fine hairs. A a retail price of around $10, they won't break the bank, and they come with a "no questions asked" money back guarantee if you are not satisfied. 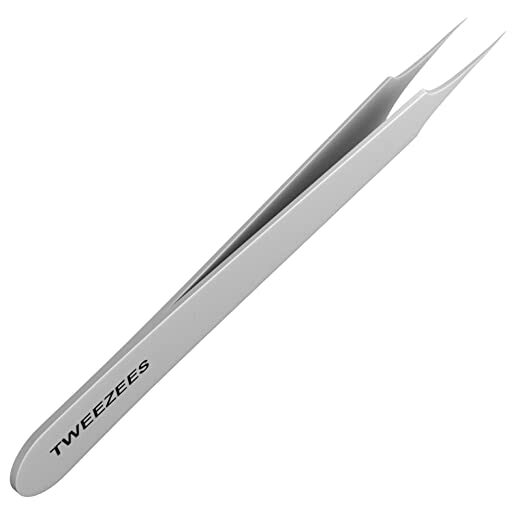 Tweezees Precision Stainless Steel Tweezers have needle-tip points for removing ingrown hairs and the like from beneath the skin's surface. They have a sleek, steel finish and straight arms, without the advantage of a wide grip section, which is the one negative that I can see. The points are perfectly aligned to make grasping fine hairs possible, and very sharp so that once grabbed, they do not slip away! They are very effective in use, and would make a good addition to the beauty or medical toolkit, being reasonably priced at around $13​. Included in the price is a handy canvas​ storage bag to keep them nice and safe, and a plastic cap to protect the tips. 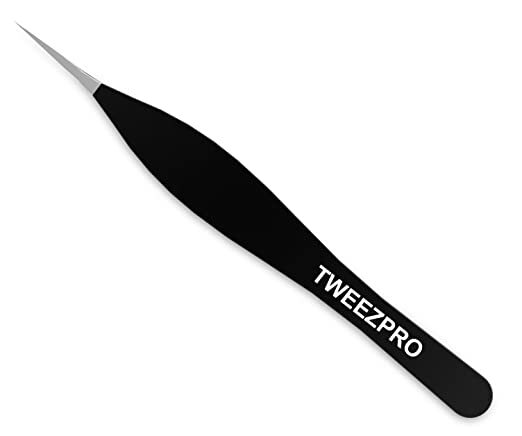 Tweezpro's Point Tweezer, manufactured from stainless steel, with a black coating has the finest pin-point tips that you can imagine. They are perfectly aligned and tensioned, and the arms of the tweezers curve out to form a wide grip area, to make holding them easier, before tapering to the tips. The overall effect is an attractive looking, practical tweezer, perfect for removing foreign bodies such as ingrowns and splinters etc. from just below the skin. ​Fortunately, as they are so sharply pointed, they come complete with a plastic storage tube for safe-keeping and to keep the tweezers in tip-top condition. In use, great care surely needs to be taken, however they are very effective in teasing out pesky ingrown hairs. Due to the needle-thin sharpness of the points, accuracy is needed to actually grasp the hair - that and a good magnifying mirror! The​y come with a one year money back guarantee and are currently retailing at around $8, so all in all pretty good value for money.